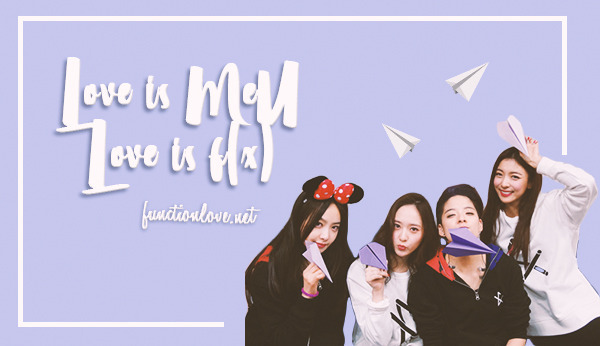 “Love is MeU, Love is f(x)” Project Part 1 and 3: “How I Discovered f(x)” – Your Stories! 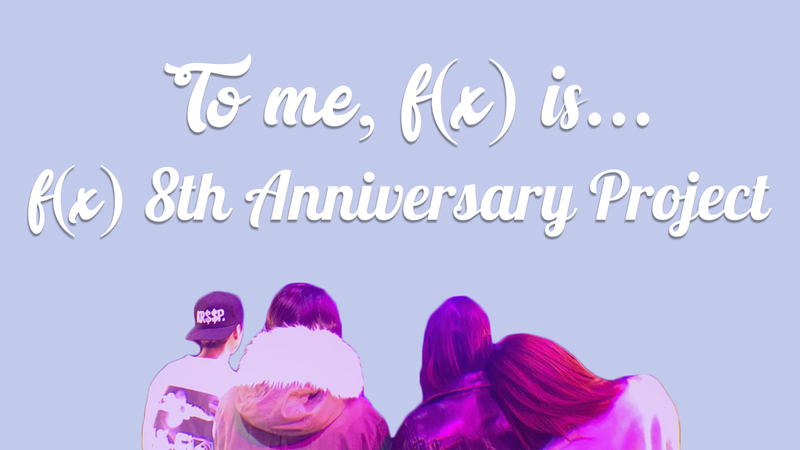 This post contains the 1st and 3rd parts of the project: MeU’s stories of how they discovered and fell in love with f(x), and MeU’s loving words. It was Krystal unnie whom I discovered first through her drama with Rain and then mesmerized by her beauty and acting, I search a lot about her and then discovered that she is in a group called f(x). I then started listening to their musics and watched their reality shows. What I love about them is firstly because of their diversity in making/creating musics that people really loves and also their individuality that makes them stand out the most, their bond that is of a family. You can clearly see through their little gestures that they adore and treasure each other and I hope that f(x) will stay longer together, be healthy together, to do things they love together and to have the love they deserve. f(x) hwaiting ! I discovered f(x) back in 2011 when i was still exploring the K-pop world by trying to listen to different groups. 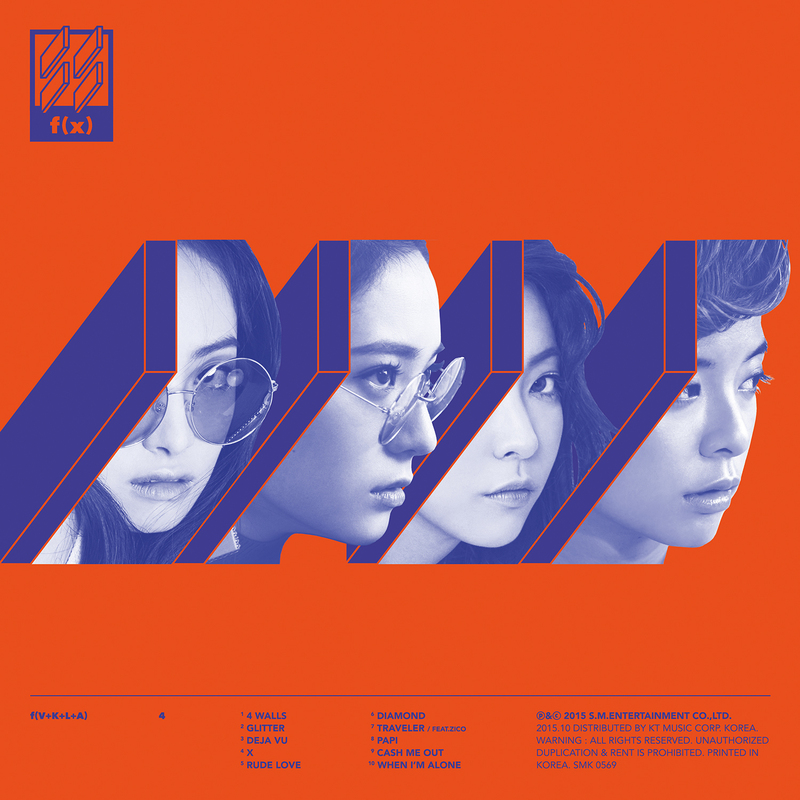 My story isn’t impressive, but f(x) are one of the bands that helped me become a K-pop fan because they stand out from most of the groups and they have an unique style, their every comeback bringing something new, different. When I was 6 years old, my mom had our neighbor babysit me for the night. Our neighbor had just moved from Korea. She made me watch a music video. That music video was LA chA TA. This wasn’t about 2 weeks after it had been released. I fell in love with the group instantly. Amber’s tomboyish style, Victoria’s dancing, Luna’s vocals, Sulli’s smile, when Krystal’s aura captivated me instantly, and to this day they still mean everything to me. I discover f(x) through jessica of snsd that she have a sister whose name is krystal that also included in a girl group f(x). When I first got into kpop, I only listened to boygroups. One day in yt suggestions, ‘Red Light’ MV appeared and I totally fell in love! I couldn’t stop listening to their songs then nor now. i was watching some snsd’s videos and then i came across ‘f(x) four walls’, never thought i’d fall for them this hard. I discovered f(x) when i started to like amber because of her androgynous style, i did search for them and i also did watched ALL their music videos that time. I got hooked in an instant and i knew im starting to love them. I discovered f(x) when I was in seventh grade. I had a classmate who was literally obsessing over Amber, always posting about her and f(x), so I decided to check them out. Rum Pum Pum Pum became my ultimate jam and I still remember that it was the first song I ever downloaded on my very first phone. I became a kpop fan last 2016. At first I only knew Krystal because I thought she was really pretty but I don’t know her group. I also stanned other popular groups from SM. Then I played SMTOWN SUPERSTAR and was amazed by the uniqueness of their music. I started to listen to their albums and fell in love completely. I started watching their videos and I was captivated by their aesthetic and uniqueness. It was back in early 2015 I was watching random music show performances from different artists. As i scrolled down what was recommended next I saw what was an f(x) Red Light performance I clicked on it and instantly fell in love with them. After that I wanted to learn every little thing about them I knew there was something special about them. I saw them on a K-pop music TV show called SBS PopAsia. They were playing Pinocchio (Danger) and my eye caught on Amber and Krystal. I ended up looking them up online after and I have been a fan since. I discovered f(x) through the YouTube suggested. I had already started to get into kpop, but they were like a group I had never seen before. Hot Summer was the first MV I watched, and I was floored straight away, just from the neon pink tank at the start! i watched the kdrama heirs and i really liked krystal’s character. she was really cute anyway i looked up the cast and saw that krystal was in a kpop group called f(x). so i searched them on youtube and i watched the electric shock mv. I am actually an smtown fan so i looked forward for f(x)’s debut since the beginning. So its been 9 years right. I was 16years old on that time. Their music is fresh and unique. At first im just liking their musics, I mean I wasnt totally a full time MEU. But my feelings toward f(x) grow during pinocchio. Plus i got a chance to see them live so f(x) is so special to me. I GUESS I found Electric Shock on youtube and liked the coreography? 2012. I was into learning kpop coreographies at the time. And the song was so catchy too… From then on, I began to like f(x) even more, and still here! Hello I’m Liza from Philippines. I discovered f(x) on 2012, when I was watching SHINee/Super Junior’s music video (I forgot if I was streaming Sorry Sorry or Lucifer that time) then Electricshock MV appeared on recommendations. I watched it then saw Amber, I fell in love with her instantly because we have similarities and I really appreciate her talents. After that, I started streaming their videos and I fell in love with each member as I watched more of their vids. f(x) is one of my main biased groups and my most favorite girl group. I tried to stan other girl groups but they can’t replace f(x) in my heart. The girl groups that I only stan are f(x) and 2ne1 because they are both unique in their own ways. f(x) has special place in my heart. I remember the time when I tried to leave Kpop world last 2014, I can’t resist Super Junior and f(x) so I came back and continued supporting them. We love you, girls! We are waiting for you and we will never get tired of waiting. It was back 2009 when KPOP was trying to go global, our music channel (MYX) was so generous enough to show kpop videos. I was turning my radar on, to look out for new kpop acts. And as I watched, I discovered f(x) La Cha Ta. I was more curious so I looked for more MVs and I found Chu and Chocolate Love. Their unique concept and beautiful faces really caught my heart; not to mention, their crazy dance moves. I know from that day, there is something about this group that’s none like the other. and that’s when I became a MEU. Because of my friend. She gave me snsd videos and ask who is the prettiest member in snsd? And my anwer is Yoona. My friend said that one of f(x) members is really looks like Yoona. I’m curious and we watch f(x) hot summer live performance. I love the song so much. The fact that all of the members can singing and dancing very well make me interest. At first, I thought Amber is a boy. And Krystal got my attention because of her beauty and charisma. All of them are beautiful, natural, and talented. So I start download so much videos of f(x). Electric shock make me become f(x) fans. They’re perfect and unique. I discovered F(x) through an app called ‘wattpad’ I think I’m grade 6 or 7 that time…I read one story and the title is ‘Labyrinth Academy’ I got hook up with the story then I discovered that the protagonist is ‘Krystal Jung’ I didn’t know her so I search up her info then I realized she has a group f(x) then I listened and watched and yes I stan them, I’ve got hook up to them so hard until now. I really miss them, I want them to comeback, to perform together…to make another memories…I love you F(x)! 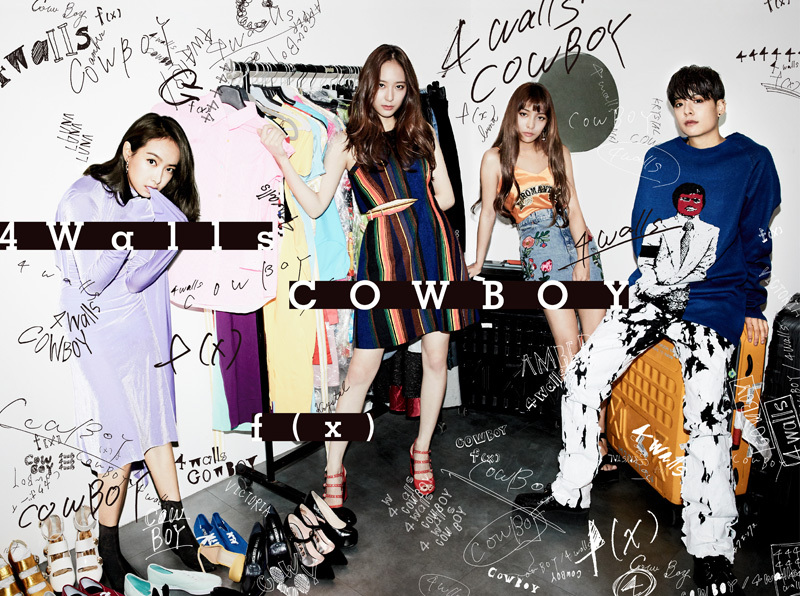 F(x) debut is on September 5, 2009. I know about f(x) when I watch LaChaTa and also chocolate love MV at YouTube. To me f(x) is unique and special group. Their concept is also different from the other girl group, I love all of their music. The members is even special to me although I’ve never meet any of them. My bias is Krystal. But I love f(x) members so much. They mean everything to me. I became an instant fan after a friend of mine showed me Electric Shock. Not only was the song super catchy and I was unable to shake it from my head for the longest time but the girls who were singing it sounded so amazing and danced so freaking well. They also had this aura of confidence and strength that I was drawn to. So, I started to view their other MVs, starting with Pinocchio, which I thought was such a strange yet interesting and fun song. From then I watched all their MVs and just enjoyed each and every one of them. They were all so unique and catchy. They were also just so distinctively f(x) and that aura of strength and confidence (with an added sense of cool) just really pulled me in. And oh by the grace of the gods, I started watching their interviews and shows and fell into the talented, goofy, strangely hilarious world of f(x). Throughout the years of being a fan, I learned something different from each member and I can honestly say that I look up to these five talented women and that they helped me escape from my own reality with their music and journeys. I’m a proud MeU forever and always. They are the first girl band which I loved first. In my opinion the girls are very strong personalities. Everybody is an individual. I miss so much Sulli, but I know she is alright now. I hope SM Ent. will see they are a perfect girl group and will cameback soon. I’ve been a MeU since around the end of 2013 which I recently realised is a really really long time. It’s kind of a long story but I got into f(x) through Amber when I saw her featured in Henry’s 1-4-3 music video. 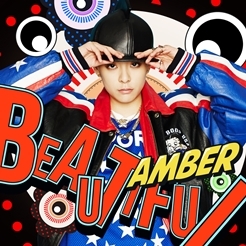 I got curious about Amber because I was sure that I heard her name before and that she was in a girl group. I thought she was pretty cool (very cool) and wanted to know more so I googled her. I then found out that she was in f(x) and then I went back to YouTube to search for f(x)’s music. The first music video that popped up was Rum Pum Pum Pum. I’ll be honest and say that I did not like it at first. Which in hindsight is probably because I wasn’t used to this style of music. Kpop in general very foreign to me at then though I believe that f(x)’s music was unique in kpop too. Anyway, I continued on to watch the Electric Shock music video and that was when I really interested in f(x). From that, I went on to watch more music videos from f(x) and realised that I loved every single one of their music videos. Especially Rum Pum Pum Pum which I fell in love with on my second listen. I was sold and became an official fan after I started watching their variety shows. Basically, I fell in love with their music, then their personalities and never left. When i was 10, my older sister used to download every single new released kpop albums + MVs to her & my phone. One day, i discovered f(x)’s Hot Summer album on my phone so i listened to it and i loved Hot Summer & Danger so much! I would always listen to the songs and watch the MVs together with my friends. I just felt like they are the coolest most badass girls i’ve ever known! It was mainly because of SM’s older groups. Knowledge of Jessica being the older sister of Krystal. Secondly, because of Hot Summer. Randomly watching tv, then Hot Summer was shown. Nonchalant, really. But then, Electric Shock came. Sulli on TTBY. I felt the connection. Like, this is it! This is the group! There and then, I became a full-pledged MeU. I found the Rum Pum Pum Pum video on YouTube in 2013 and from then on wards i was in love! I watch the collab Anna Kendrick with fx then I searched them and find them. Later I watched the electric shock mv! My sister showed me the music video for 4 walls. She did say I was abrasive of it because this was my introduction to kpop 2 years, so I was feeling it. Then I noticed I started going back to the music video and like the aestheticness of the video. I’ve known f(x) when they join a collab stage with SHINee in 2010. I’m not into them at first.. as time goes by, they released pinocchio and hot summer that made me into them.. in 2012 I join an agency in roleplay world and the only girl idol that attached me the most was Victoria.. I learnt about her by watching f(x) performances, variety show, wgm and many more.. from that way, I’ve fallen for f(x) more until now.. they have their own charm which I can’t compare to other girl groups.. I just love Victoria at first, but now I love all the girls equally.. such a pity that SM couldn’t make a comeback for f(x), but it’s a relief that everyone doing their job while taking care of each other.. their bond is really strong.. It was in 2010, Nu Abo brought me to f(x). I was like why this group were so unique, the hair style (two tone) and Amber. Then I discovered all of their songs one by one, thats it when I knew La Cha Ta and their ultimate performance in a heavy rain but they still smiling. Hardworking Victoria make me fall in love more with f(x). I started to love f(x) and watch all the videos about them. F(x) make me turn as a SM stans. I adored all group in SM but f(x) is my ultimate bias. It was in 2010 when I started loving KPOP, particularly Girls Generation. I discovered f(x) when I found out that Jessica (my bias) has a younger sister in another girl group. I totally fell in love with the group during “Chocolate Love” because they were all so charismatic and have this aura that’s different from other girl groups. I’m start know f(x) is from amber eunnie and sica eunnie, the first time i see them is they look not good at all. And I’m start to hate them. But, just in a few days. I start to search everything about them on internet, coz I’m curious about them. Start from “HATE TO LOVE”. After I’m watch they MV and hear their song, I would say. Ahhh they are so good, I love it. And I’m just realize that I’m so fool to hate them he he… Now, f(x) is like my OXYGEN. I always watch them for 4 times in 1 day (morning, afternoon, evening, and night). I love them so badly 😄 from HATE TO LOVE. That’s my story how I love f(x).. I am a fan of Anna Kendrick. And when I was searching a video about her, I accindentally saw the film that she made with f(x), Funny or Die. In the beginning of the film where the music video of ‘Electric Shock’ was played, I immediately fell inlove with them. I instantly became a fan. I can still remember the day when I discovered f(x). I listen to their songs and watch their music videos whole day! Literally. F(x) is the one who bought me to kpop. That time, I already know bigger groups than them. But they are the ONE and ONLY kpop group I stan. I was watching “To The Beautiful You” and from there I started follwing f(x). I may have not be there for them in the begining, but I’m here ’til the very end. I discover f(x) during their Electric Shock era. I found them as a group with their own charisma which really captivated my music tastes. My name is Ban, from Canada. I had been aware of Kpop growing up, but never go into it knowing it would be difficult as an international fan to follow and support groups. However, one day I was browsing youtube and came across Ambers Shake that Brass music video. Amber caught my interest right away because she was expressing who she was as a person in an industry I believed to not allow female idols much freedom in expression. I learned Amber was part of a group called f(x), and right away began to watch all their music videos, variety shows, interviews since back when they debuted up until their 4walls release back in 2015 around when I discovered them. I loved everything about them. They were such a close nit family, like siblings who love one another but sometimes get on each others nerves. Their love for performing always showed and it was always a joy to watch their stages. f(x) is unique in music and style. Each member has great talents and a big heart, and they are not afraid to be who they are and show support for their fans. They are very relatable. f(x) makes me love who I am as a person. i think i’ve know about f(x) since like 2012, when one of my friends started listening to kpop and i found out what it was. i didn’t pay attention back then, but f(x) were always on my mind, i thought amber was really cool and that the group’s name was super smart and original. i started listening to kpop in 2016 and at the begining of 2018 i wanted to know and stan more groups, so one night i decided to search for f(x), after watching a little bit of amber’s “where is my chest” video. i thought she was funny and pretty and really liked her sarcastic sense of humor. amber was the main reason of why i got into the group. i think it took me only one night to fall in love not only with amber but also with the whole group, i connected with their music even though i couldn’t understand it. i watched a lot of videos of the girls, learned their names and fell in love with their personalities and the beautiful bond they have with each other. it’s been seven beautiful months with them, but they feel like seven years. i haven’t even lived a comeback or anything with them yet, but i know that, no matter what happens, i’ll always be there by their side. right now i can’t imagine a life without them, they’re my everything so much more. i love and stan a lot of groups, but no one will ever be as special as f(x) in my heart. happy anniversary my girls. love always, agos/lulu from argentina. I was studying music at college, and one of the units we studied was “World Music” and we studied Traditional and Contemporary music. This meant that I studied K Pop, specifically we looked at SNSD and BIGBANG. But the songs we looked at were terrible, no two ways about it. So I decided to look into Korea’s Rock scene, and found FT Island, CN Blue and Guckkasten. Well in my research of the latter, I found a video on youtube of Guckkasten performing with 5 girls (Who just so happened to be F(x)) I liked the vibe that these girls were giving off, so I saw a video off to the side of an “Electric Shock” Areia remix (Which I highly recommend) and fell in love with this music. For the record I also loved the “Hot Summer” and the “Nu ABO” remixes. Well a few months of listening to these tracks in and amongst my personal playlists, and I decided it was a MUSIC SIN that I hadn’t heard the original versions. I first listened to “Electric Shock” then “Red Light”. Upon listening to “Red Light” I realised that if I was going to listen to any group, it would be these, track after track I wasn’t ever disappointed; “Pretty Girl”, “Milk”, “Dracula”, “Danger”, “Toy” etc. I liked how the sound never stayed in one place for too long. Now I grew up around Rock music, The Black Crowes and Stereophonics, then later, Metallica and Iron Maiden, all are groups that don’t have fandoms, or that kind of culture. As such I’ve always felt out of the K Pop scene, I will never call myself a fan of the genre, I figured I like F(x) and a few of the Korean rock bands, I’m not a K Pop fan, I’m a fan of good music. So when I heard that F(x) released a new album I had to hear their new sound, since it was never the same twice. I really liked the “4 walls” album. I thought it was new and different and very European sounding, given that I’m from the UK, that says a lot. I got a few of my friends to listen and they couldn’t believe there was a side of K Pop that didn’t sound cheap and cheesy and they actually liked it too (Their experiences were restricted to “Gangnam Style” and “Gee”) I loved the new sound, especially tracks like “X”, “Papi” and “When I’m Alone”. I only own the Red Light and 4 Walls albums, but I do live in the UK and it’s really expensive to buy K pop albums over here (Release price of 4 walls was £45 or about $50) I don’t really listen to any other groups, I’ve seen them perform in London at the Korean Festival along with Guckkasten, and then again at Kcon Paris. I do look forward to a new album, I think it’ll be exciting to see where they go next. I discovered kpop in 2012 thanks to PSY and since then I added the genere to my playlists and started listening to it sporadically. I didn’t have a favourite group or artist, I just listened to random songs. Then, in august 2015 I was on holiday in London and as I went to visit the National Gallery, in Trafalgar Square was held the London Korean Festival. Taking a flier I discovered f(x) were going to sing in a couple of hours and I was like “Wow, I know them!”. Being Italian, I never thought I would ever been able to see any kpop artist perform live, so I was really excited and I had to beg my friend to stop and wait for the performance (she didn’t want to listen to “my Chinese music”). We waited and Amber came out singing Shake That Brass with Luna, then Krystal and Victoria joined them and they sang Rum Pum Pum Pum, Hot Summer and Red Light. It was AMAZING. Listening to music is a thing, watching a performance is definitely on another level. Well, since then i “fell in love” with them and even even though recently they are not promoting together, I try to follow their individual schedule as much as I can. Because of To the Beautiful You. I was a huge SNSD fan, and I really wanted to venture into more kpop groups, so I just clicked on random music videos. I stumbled upon Red Light, and I liked it. A friend of mine also suggested Rum Pum Pum, and from then on I was a casual fan. It wasn’t until the release of 4 Walls though, when they became my ultimate group and since then I’ve loved them with all my heart. I discovered f(x) while starting out in Kpop back in 2013, and I watched their live performance of Rum Pum Pum Pum. I thought their unique concept was very refreshing since it’s quite different from the usual girly concepts I see. I’ve been a fan of them ever since! I was scrolling on Youtube when I found “Chu~❤!” by f(x). I loved that song and I started to listen more songs by our girls. I discover f(x) from my friend, she show me some videos and i thought f(x) is a unique group and i fall in love with them until now! The kpop fever was starting to go really hard and I just thought why not jump on the bandwagon and when you decided you don’t want to be part of it anymore just jump off. While looking for groups, I saw the LA ChATA teaser. From then onwards, it just became irreversible. I loved them too much. I’ve loved them then, I love them now and I’ll love them for years and counting. So, I was into Korean dramas before kpop, and had watched TTBY and The Heirs. I think it was Krystal I was checking online when google suggested Sulli and showed me the connection between them: they were in a group called f(x). I listened to their music, and I haven’t stopped since then. Hard to explain, but it is simple, I came in because of Sulli’s to the beautiful you. To be honest, I am saying that SHINee is the first ever group I stan, but no, it is f(x). As I enter, it was the end of Rum pum pum era and I didn’t expect that f(x) had a comeback like once or twice (if lucky) a year. Red light was the best for me since it is where I did experienced being a true MeU (we don’t have a fandom name back then though, we call ourselves aff(x)ion, those days were the best) Anyway, going back, when Sulli left f(x), my world almost crumbled into pieces. But I saw Krystal, Victoria, Amber and Luna. I saw that I joined this fandom because I love them all. Not only Sulli. Now, I am doing my best, getting update for f(x) and to their former member, Sulli. In 2014, Ailee came to Brazil. I couldn’t go to her show, but on TV I got to know her and to be enchanted by her music. And it was precisely through her great friendship with Amber that I finally got to meet f(x). I was fascinated when I heard the music and watched the MVs; the first song and MV I met was Red Light. The group is really amazing and very talented. I also made a fanfiction with them and got to know them more thoroughly in the research I did to create the characters. All of them, Victoria, Amber, Luna, Krystal and Sulli are girls full of talents and abilities. They are complete ladys, angels who have been sent to earth to bless mankind! I found a song ‘Danger’ on Youtube when I was 12. At first, I just listened and I thought nothing was special to me. Then, I actually fell in love with f(x) when I watched their music video. I searched their informations, their profiles: birthday, position, their families and so on… I have been a fan for 6 years already. And I will be a MeU till the end of life. It happened in december 2017. On the avatar in social media of my friend i saw Amber. I wonder “is it a girl or a boy?”. Google said that Amber is k-pop idol from f(x). And then i started listen their music and now, i`m here. Through Amber! I saw Amber in a buzzfeed video and she just seemed so interesting and she was gorgeous so went to check out her music and learnt that she was in a girl group called f(x). f(x)’s music was so unique that I HAD to check out ALL of their discography and NOTHING disappoints. As for the members? I instantly fell in love with Amber but I started to get know and love f(x) when I watched Amazing f(x)!! That’s how I found out about my beautiful girls. I’m so proud to be a MeU. I discovered F(x) about 2 years ago by watching a video on YouTube where Amber was helping Steven from buzzfeed to be a Kpop star. I thought Amber was cool and I wanted to hear what F(x) sounded like. I had been watching Korean dramas for a while but I didn’t know much about Kpop. The first music video I watched from F(x) was Pinocchio (danger) and I really liked their sound and style. F(x) was the music I had been wanting or missing in my life. I watched all their videos and shows that I could find! The more I learned about them and their friendship with each other the more I loved them! I like all the members of F(x) but the more I watched Luna I fell for her charms! She became my bias and I just love her so much! She’s Awesome! I don’t understand why more people don’t love her because she put her all into her work and is so talented. Her voice is Amazing and she deserves the best and I hope someday more people will love and support her. All of the F(x) members are very talented hardworking and fun bunch of girls. I only want the best for them and I hope Sm will let them have at lease one comeback when they are ready! Amber is my second favorite I can really relate to her and she speaks English so that’s awesome! She funny and really cool person! I really like that Amber and Luna have their own YouTube channels and make videos for us because I like seeing what there up too. I follow all the members and their individual activities and I try to be a supportive as possible. I have multiple copies of their albums if I had more money I would buy more. I wish I had found F(x) a lot sooner but I happy I found them when I did. I wish I could give back some of the happiness their music has given me. Happy 9th Anniversary F(x)! Thank You for nine years and many more to come! I will always love and support F(x)! F(x) Hwaiting! Which f(x) song do you hold close to your heart and why? Which f(x) moment do you treasure the most and why? How do you view f(x)’s bond/friendship? What is your favorite f(x) show and why? How did you react to the MeU fanclub name reveal? Only now that I have checked all those comments and stories. They are all simply wonderful. And I’m very happy for your initiative. Congratulations!